Reading on the couch or reading on the bed? Both. Scratch that anywhere really. I read on the floor even. 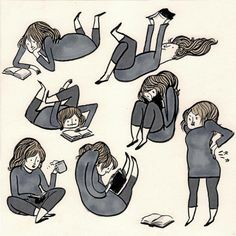 I'm one of those readers that get twitchy, but I'm also really into my books, so I don't really think about the way I sit while reading. My mom once walked in to me hanging over the side of the couch with my book on the floor as I read. Pretty sure I ended up like that cause I didn't feel like holding it anymore. Either way, I will be reading in all locations based on comfiness alone. I'd like to say both, but the majority of books I read are the female perspectives. Sometimes it's combined, like in the current series I'm reading by Nalini Singh. Still mostly a female lead though. Sweet or salty snacks while reading?? Sweet. I am most definitely a sweets lover. Although I only eat while reading if I'm on my cell since I find it easier to have a hand free in that case, or my laptop. My most recent snack of choice has been dried pineapple. If you haven't tried that stuff, you need to it's beautiful. Again, I am stuck saying both. How could I choose. Either way it's more books to read. As long as the author is doing a good job, ie not dragging out the story or not rushing, I'm happy as a clam. Hmm. I think I'd have to go with third person here for preference. This one is based off of my own writing style more than anything, it's what I'm most comfortable writing. Reading though, third person always just feels so natural somehow. Of course I love first person. Honest, I'm not sure it truly makes a true difference to me reading it. I actually don't really notice half the time, especially if it's well-written. Night reader all the way! Maybe I shouldn't be true proud about that since it's also the main reason I'm always tired for school. But I'll read into the long hours of the night if I can. Although I'm also prone to just read the entire day if I can. I would go to libraries more, if not for the fact that I'm a five minute walk from a Chapters. So bookstore is my go to. Anywhere though where I'm surrounded by books on their shelves will make me happy though, no doubts about that. How about books that make me laugh until I cry? Or cry until I laugh? Either way, I'm going with both on this one. I need to be able to enjoy a book on an emotional level, while I rarely cry, it still remains an addiction to have my gut clench or my throat tighten in the midst of reading. Laughing at apparently nothing to the sights of others is also a good one. I just love appearing a bit loony. Or sometimes I just sit there with my lips twitching in amusement uncontrollably. Black or White book covers?? Black. This answer is simply for the mysterious effect of something dark and haunting. White connotes much more innocence and weak characters at that. While that may not be particularly true, it's still an instinct thing when I'm buying books. Also, a quick book at my bookshelf (too tiny of one I might add), and the majority of those spines are black or dark coloured. Guess I'm book racist. Why did the last one have to be a hard to answer one? Just so you guys know, I am whining, big time. I mean it really is the character isn't it? The plot doesn't just run itself. It's the decisions the character makes and the way they act that makes things workout where they do. So character driven for me I guess. Thanks to Michelle one more time for the tag!